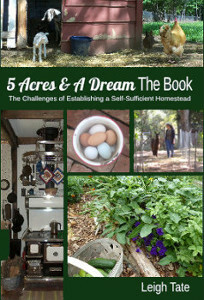 5 Acres & A Dream: Got Goats? We Do! I have to say that there were some days when I thought we'd never get to this point. It seemed as though the brush was going to take over the place and we were going to disappear under it, never to be seen again. 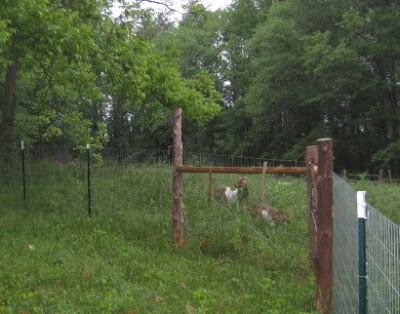 But here we are at last, happy owners of our first two goats. Meet Abigail and Bathsheba, a Boer cross doe and her doe kid; mostly Boer with a touch of Nubian somewhere along the line. 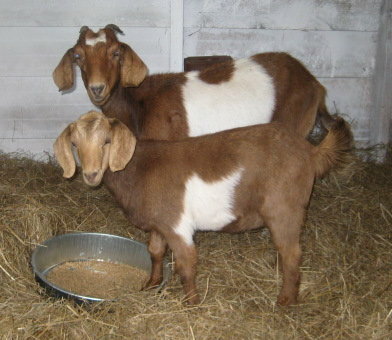 Mama Abigail is about 17 months old, and Bathsheba about 5 months. I brought them home late Monday afternoon, in a dog carrier in the back of my Jeep Cherokee. They spent the rest of the day and night in their new home in the right half of the chicken shed. I would like to say it was without mishap, but in the morning I found Abigail with her head stuck in the nifty hay feeder we'd made from a cattle panel. Thank you, Raising Goats For Dummies. Minor panic on my part, but she was freed without injury or protest. Which is pretty good since neither is particularly tame. On the other hand they are not particularly wild, so perhaps I got to play the role of heroine(???) Or maybe I'm just the food lady. The next morning (yesterday), they were allowed out for the first time. It rained some the night before, with rain threatening for the rest of the day. Goats don't really care to get wet, but they were curious enough to wander outside for a bit to explore their new surroundings. Being a meat breed, these will be our breeding stock. DH is happy about that as he is the primary meat eater in the family. 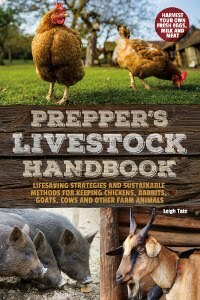 I can pretty much take it or leave it, but would much rather raise our own meat if we're going to eat it. 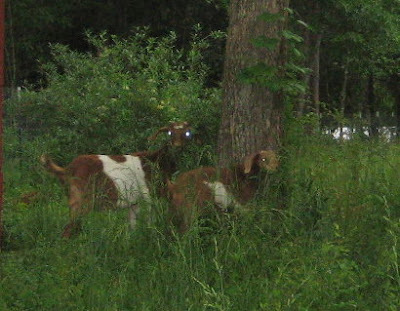 It was a gloomy enough day so as to set off my camera's flash, as you can see from the reflection in their eyes. Hurray for GIMP, so that I could lighten the photos up enough to see what's going on! I'm not interested in making pets of them, but I do need them tame enough to handle as needed. I worked on that by talking to them all the way home, so they can get used to the sound of my voice. 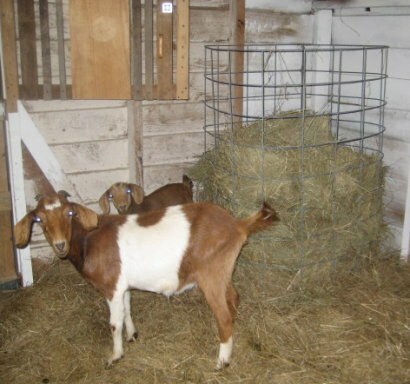 Then they got a ration of goat feed once they were installed in their half of the shed. I check on them frequently and spend a bit of time talking, but keeping a respectful distance. At this point Abigail will come when she sees me, but backs away if I put out my hand. Bathsheba just follows her mother and has no particular interest in me whatsoever. The chickens have never seen goats before and have been super curious. Rascal has never seen them either and is super worried. The goats just take it all in stride. Two probably won't make a terribly huge dent in the one plus acre of brush, weeds, and vines we have fenced in for them. I'll be keeping my eyes open for a few more, at least one dairy and maybe some dwarf types? Stay tuned for more on that. We had goats growing up and we would stake them out in our yard to eat the grass. It saved us kids mowing the lawn! Ha, ha! Of course they would only eat in a circle...we had a funny looking yard. I hope you love your goats as much as we love ours, they are so enjoyable to have! Abigail is the name of our smallest pig! Congrats on your new aquisitions! Congratulations! I'm thinking that these girls will test out all your goat supplies and help you to make any needed modifications...tester goats? LOL! They seem to like their new home. Can't wait to see who comes next. The goats are lovely, congrats! And I'm sure they will clean up all unwanted shrubs. They look great!! 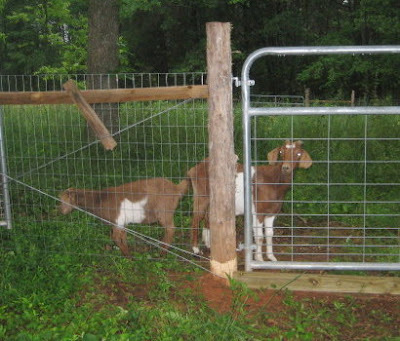 Oh goats, wow you have really come a long way from when you first started this blog, really exciting. But I thought only male goats had horns, obviously I'm wrong, dumb city kid. LOL.. They're cute. I'll have to admit to not actually having seen a Boer goat before. What pretty little does! Did you get to name them, or were they already named. That's wonderful. They are a bit goofy looking with the Nubian heads and Boers bodies. I'm afraid I'm make pets, so better you than me to have them. Michelle and Rainbow Rivers, thanks! They seem to be accepting us and their new home. They just seem like they've always belonged here. Renee, "tester goats", lol. For DH they're "learner goats," but I think he'll get the hang pretty quick. Charlotte, we can see an improvement in the shrubbery already. Best part is they like kudzu! Deep End, yes, it's been just about a year and really, we've done a lot. Some days it seems like things will take forever, but at times like this we can see our progress and it's encouraging. I think a lot of folks think that about goat horns. Some are born without them, but a lot of times the horns are removed when they're very young. Obviously not so in Abigail's case. Nina, Boer goats are really common around here, but these aren't typical looking ones. 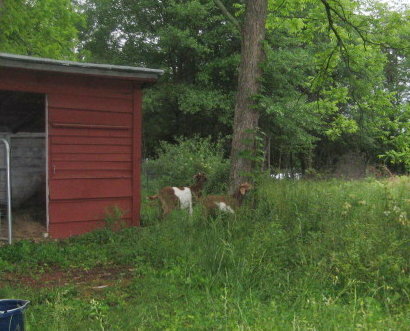 This link, Boer Goats Home shows more typical looking ones. Ours have a more dairy goat look about them, except Abigail has 4 teats, which is common with Boers. Sharon, they do look more like Nubians than Boers, though Boers have droopy ears too. Breed isn't so important but DH wanted a few meat goats (though we won't eat these). Mostly their job is brush clearing. I will be getting a dairy goat though too. Congratulations! How exciting! Abigail looks a little small to me- for mostly Boer. And Nubians aren't exactly small either. But she's pretty young still. I'm guessing she'll grow a bit this year. Do you know much about their history? Leigh, I've nominated you for an award over at Boulderneigh; it fits you so well! Maggie, the guy I bought them from said they bought them from a Boer breeder in the area. Since they weren't purebred, no lineage had been kept. At one time they were interested in raising their own meat, and had Abigail bred to one of his registered Boer's, Bathsheba's dad. Since then, they decided they wanted to raise LaManchas and were selling off their other goats. You're right, even Abigail isn't full grown, so I do expect her to get bigger this year. About the only other information I could get is when their CDT vaccinations are due, and what kind of wormer he'd been using. That is soooo cool. I am VERY excited for you! Here they are!! Congratulations on your new additions!! I was surprised to see how the meat goats had such different bodies from the milk goats. Their skeletal structure was really different. I've been enjoying some locally made goat cheese lately. The family that makes it has a "cheese cave", which is a little shed partly buried between two rock walls. Very cool! You really have made an amazing amount of progress in the last year!! Congrats!